Compatible with iPhone 8 / 8 Plus / X / 7/ 7 Plus (2016 New Apple iPhone). 10 TIMES LONG LASTING: Unique air hole design and extended cord boost the lifespan bend over 18,000 times which is multiple times more durable than other regular Lightning cables in the market. 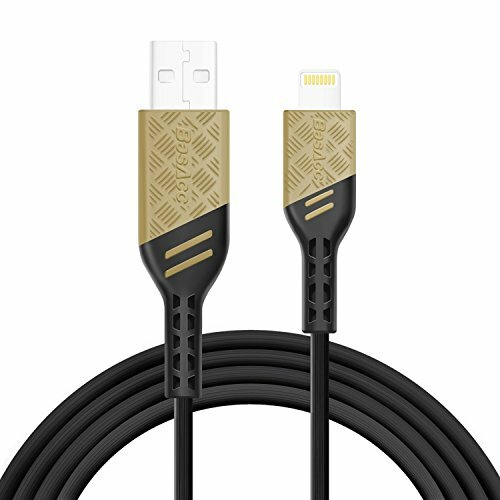 INCREDIBILY STRONG CABLE: The outer layer of the cable has a unique waved pattern design which is 4 times more durable than regular cable jacket. Made with a Kevlar® fiber; with its high pliable strength-to-weight ratio, Kevlar® fiber is 5 times stronger than steel. ANTI-SLIP DESIGN: Double injection housing making it extra durable and capable of withstanding the wear and tear of daily use. APPLE MFi CERTIFIED: Ensures perfect compatibility and best performance on charging and syncing. It is guaranteed to work with all Apple devices and future updates. 24K GOLD PLATED LIGHTNING CONNECTOR: Prevents from corrosion or rust. BasAcc® is a registered trademark. Only authorized seller of BasAcc® can sell under BasAcc® listings. All rights reserved. All trade names are registered trademarks of respective manufacturers listed.